Focused on Story: Celebration Time--Win a Flamingo! It's celebration time! My mystery/light horror story, Sunshine Boulevard, was released one year ago today, March 1. What an exciting time for me. Last year I experienced the joy of being published and the agony of wondering if anyone would like the story. The experience is similar to sending a daughter or son off to school. Mom is thrilled to have some time to herself, but worried how cruel the world will be to her "baby." I think many authors feel their stories are their children, so the publishing process is like giving birth. Today I am celebrating my book's first birthday! One benefit of publishing an e-book is it can have a chance to celebrate many birthdays. Booksellers will not remove it from the shelf after three months to make room for another book because there are infinite book shelves in cyberspace. In my blog introduction I wrote, "Come along with me on a new adventure into the world of writing, publishing and selling." What an adventure it has been. This past year I learned about the publishing world, honed my writing skills, and made so many new friends. I want to recognize and thank Lea Schizas, the editors, and cover artist Delilah Stephans at Muse It Up Publishing for shepherding me through this daunting, but exciting world of publishing. Karen McGrath, content editor on my book, is in my thoughts today. I'm sure she is red lining passive words and suggesting changes in the POV for stories written by Heaven's angels. The generosity and support of editors and fellow authors overwhelmed me. That is not what one would expect in this world of thousands of books. Who knew instead of competitive attitudes and petty jealousies, the world of publishing includes so many thoughtful, kind people? Bringing my book to readers truly has been a journey, and I look forward to more challenges and adventures as I continue along this path. I imagine you're wondering about winning a flamingo... Perhaps you are even asking, "Why a flamingo?" 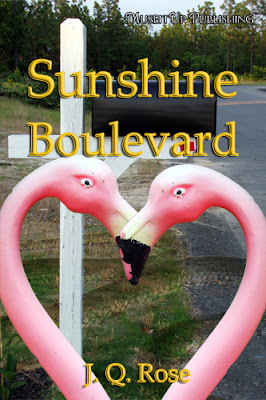 Take a look at the book cover for Sunshine Boulevard. Delilah Stephans, cover artist at Muse It Up Publishing, chose flamingos as the image to evoke Florida. Since my book takes place in the Sunshine State, I agreed it was the perfect design for the book cover. Notice the flamingos are in a heart shape? Delilah decided that too because the main characters are Jim and Gloria Hart, snowbirds from Michigan. Oh, yeah, about winning the flamingo. You KNOW you want one. But you probably don't want the hassle of feeding, watering, clean-up, and walking the bird. So I have the perfect solution. Just enter a comment to be eligible to win a flamingo...that is a flamingo pen. Now if you are a writer or not, I know you will cherish this unique pen. You will be the envy of your neighborhood, school, co-workers, family, and friends. I mean really, who else is going to have this one-of-a-kind writing utensil? Maybe in your comment you can tell us how you plan to use it. The winner will be chosen in a random drawing and announced on Sunday, March 4. Look at the picture below to see the prize. Can't you just see yourself penning a best selling novel, writing out a note card, or sending off a postcard using this delightful creature? Thanks for stopping in for the celebration. Help yourself to the delicious flamingo cookies and fresh strawberry punch. (Strawberry Festival time in Florida now!) Please note the flamingo napkins and lovely floral centerpiece with the big plastic pink flamingo in the center. While you are munching the cookies, be sure to take time to watch the Sunshine Boulevard video. Big thanks to Cool Text for the Celebration graphic. Congrats on the one year anniversary of Sunshine Boulevard. The trailer is so cool I just HAD to get my hands on a copy of the book. Pure Genius! Love you J Q! J.Q, great anniversary post and Happy Birthday to Sunshine Boulevard. It is still on my TBR list. I would love one of those flamingo pens. I will use it to bring color to my desk in my pen holder. I will also use it to write birthday cards when it's needed. I love to write poems to all of my relatives for their birthday. So I would also write poetry with it. Thanks so much for the good wishes, Jane. Mindy, I'm glad you think the trailer is cool. It was so much fun to create. It must have worked since you decided to get a copy of the book. Thank you! Karen, you are my cheerleader AND mentor when it comes to writing and marketing. Barbara, What wonderful ways to use the pen. I especially love the idea of your writing birthday poems. It does add a LOT of sparkle and fun to your desk! Janet, that's wonderful! Yes, publishing is an adventure, and one of the most wonderful and to me completely unexpected things was the unconditional support of the Muse writers for each other. I treasure you all and you do know you're one of my crown jewels, right? Congratulations! That pen is awesome. Happy Anniversary, Janet! That pen is awesome. The feathers would make a fantastic cat toy. My three buddies already sit in my lap when I write. Imagine if I wrote with feathers?!? Great post, ma'am. Marian, thanks. I hope you enjoy the book. Gail, hey you are a gem, Girl. Joselyn, Yep, this pen IS priceless. Thanks everyone for visiting. Winner announced on Sunday! Have a wonderful weekend, J Q! Happy anniversary, Sunshine Boulevard. What beautiful marketing objects you have, Janet. How clever. You have shared your experience we can all relate to, but I have just discovered something else about the author from this post. I wonder if anyone noticed. I'll pop back later, after my swim with Jim and Gloria, and tell you what it is. hehehe. Pass the flamingo cookies, please. Congratulations on your anniversary! And I agree...it's a great pen! So you give in? Okay, for this elite group only, I'll reveal my discovery. If you look closely at the beautiful flamingo pen, you will notice the person holding said pen is left handed. Now if that person is our celebrated author it is no wonder she is so creative. She's in good company. what looks like a cuff on my wrist is actually the cord to the camera that fell down as I snapped the picture. Interesting line up of leftie writers. Thanks for the info. Are you left-handed so you can join the ranks of these creative writers? And thanks for keeping me in suspense of what I may have unknowingly revealed in this post!! That was fun. A year already! Wow, Janet, it went by fast. And yes, I'd love a flamingo. Pink, left-handed, or otherwise. I don't have a lot of left-handed pens, so a pink one would rock! All of my husbands were/are left-handed. They were kind of in their right mind. Ah Ha, so you threw in a red herring with the pink flamingo. mmm. Love your pearl nail polish. You don't bite your nails! Wendy! I totally crown you Queen of Observance. Nice...how adorable you are and very perceptive. Thanks, Joylene. The year did fly by. Marva, LOL..So do you have left-handed kids? Our older daughter is a lefty, but my hubby and I are right-handed. Go figure. Wendy, you can write anyway you want to, just keep writing!! Hey, Karen, I bet Wendy rocks at finding Waldo in those kids' books, Where's Waldo. Congratulations to Susanne Drazic. She won the fantastic flamingo pen. I know she'll enjoy hours of writing fun with this delightful writing instrument. Yay, Susanne. Thanks, Everyone, for commenting and joining in on the fun. The book trailer is terrific. Well done. So, left or right handed, you have talent to spare. Rosalie, glad you liked the book trailer. It even scares me when I watch it. Thanks for visiting.